When Fitbit launched its first true smartwatch last year, it had something to prove. The company had just bought beloved smartwatch pioneer Pebble, and up till then had struggled to produce a wearable with a proper operating system. So it’s no surprise that the Ionic was stuffed full of features. It not only tracks a comprehensive range of fitness metrics and provides onscreen workout tutorials, but also stores your music, streams to Bluetooth headphones, runs third-party apps and makes contactless payments. It even has a blood-oxygen sensor just waiting for the company to turn it on (but right now is completely useless). The company addresses all that with its second smartwatch, the Versa. For starters, it will cost just $200, and comes with a simplified operating system that reduces the swipes you need to see your daily info. Most important, the Versa is the best-looking Fitbit yet. 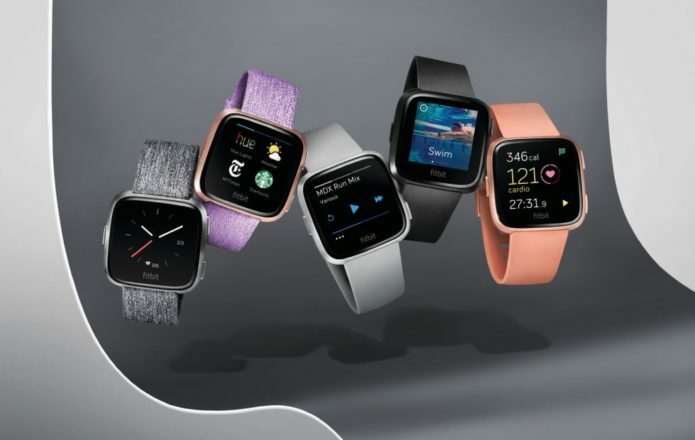 The Fitbit Versa is a prettier, cheaper version of the company’s first true smartwatch, the Ionic. It lacks built-in GPS and NFC payments, but you’ll save $100 if you opt for the new watch over the original. The Versa still boasts four-day battery life and a comprehensive range of health-tracking features, making it a strong fitness-centric smartwatch. Yes, the Versa looks like a slightly wider Apple Watch, rounded square face and all. 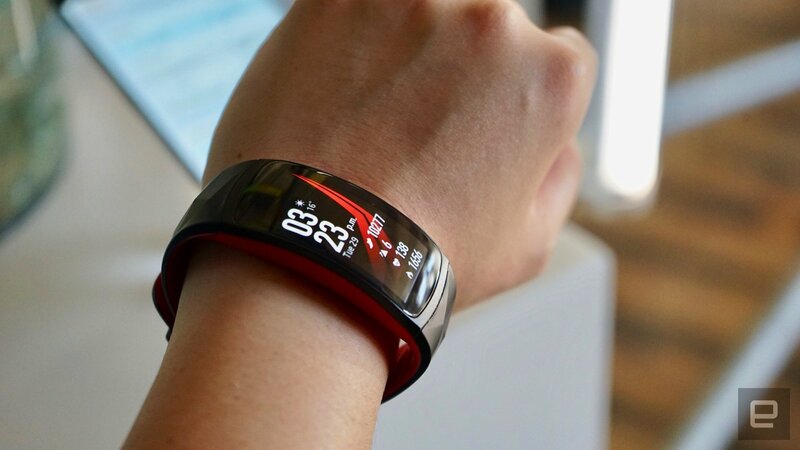 But compared to the awkwardly geometric Fitbits of the past, the Versa blends in nicely. People have gotten used to the way an Apple Watch looks, so the Versa’s resemblance to that is an asset. In fact, with the right band-and-case combination, like, say, the rose-gold face with a blue leather strap, you may even find the Fitbit prettier than the Apple Watch. Aesthetics aside, much of the hardware here is similar to the Ionic’s. The Versa’s 1:1 screen aspect ratio is slightly wider, but both displays are crisp and bright. The images in the background of the Coach app still look vibrant and clear on the Versa’s 1.34-inch face. With the new display dimensions, apps that worked on the Ionic will need to be tweaked to fit on the Versa, but we’ll get to that later. Meanwhile, the Versa has the same heart-rate sensor and water resistance rating (up to 50 meters) as the Ionic, making it a great device for tracking your swims. It even has the same inactive blood-oxygen sensor onboard, just sitting around waiting for Fitbit to do something with it. But there are a few key differences. The Versa doesn’t have GPS built in — you’ll have to use your phone if you want to track your running route. Also, in the US, the basic version of the Versa is missing NFC for Fitbit Pay. You’ll have to shell out an extra $30 for the special edition to get that function. These are the tradeoffs you’ll have to accept for the $100 drop in price. If you think you’ll want to run outside without bringing your phone, you should probably pick the Ionic. When I went out for a run, it took the Versa about 10 seconds to connect to my phone so I could use the GPS. On the Ionic, you won’t have to wait as long before you can start running, but it still needs a moment to find your location. One of the main differences between the Versa and the Ionic is the updated operating system. The Versa will ship with Fitbit OS 2.0, which the Ionic will get later this year. The new software places a dashboard under the Home screen, so you can see your day’s stats just by swiping up. To do that on the Ionic you had to swipe to the left to pull up your apps, then launch the Today app. OS 2.0 just reduces the steps to one. This actually encouraged me to check my daily progress more often, and motivated me to stay on target. Notifications also got an overhaul. You can swipe down from the home screen or long press the top right physical button to pull down a list of your notifications. When an alert comes in, it peeks down from the top, and you can flick it away. But if you’re paired to an Android, you’ll be able to reply to messages from your wrist with one of five customizable templates. Too bad quick replies isn’t live yet and won’t roll out until May. Another feature that won’t arrive till May is “female health tracking” — as in, tracking your menstrual cycle so you can look out for symptoms or when you’re ovulating. You can already download apps on your phone that do this, but it’ll be nice to see this on your wrist and integrated with the rest of the information Fitbit already has. In addition to the built-in fitness-tracking features, you can also make the Versa more useful by installing third-party apps. Since the Ionic launched, Fitbit has grown its app store, although it’s not clear how many of these have been tweaked to fit the Versa’s wider face. You’ll find nifty options like Yelp, Nest, Philips Hue for smart light control and The New York Timesfor news updates. I particularly enjoyed playing 2048, even on the Versa’s teeny screen. I also appreciate the Versa’s relatively long battery life. Fitbit promises you’ll get “four-plus” days out of it, and indeed the watch conked out after close to five days of use, during which I tracked at least two workouts and four nights of sleep. The Ionic lasts slightly longer, but the difference is not significant. For the price, the Versa’s primary competition are the Samsung Gear Fit 2 Pro and the Apple Watch Series 1 (which costs $250). While both offer similarly robust fitness-tracking tools, the Versa has the edge on battery life — it’s the longest-lasting of the lot. Those who must have built-in GPS should consider the Gear Fit 2 Pro. It looks nothing like a watch, but has almost all the features the Versa does with a bigger, brilliant display. You can play Spotify tracks offline, monitor your swims and map your runs phone-free. We haven’t reviewed it yet, so we can’t vouch for the battery life, but Samsung promises it will last three to four days. Owners of iPhones may prefer an Apple Watch, although the Series is getting old. It lags behind the Fitbit in battery life and probably won’t be available for that much longer. If you’re after an Apple Watch and its superior compatibility with iOS, you’re better off shelling out the $80 extra it’ll cost to get a Series 3 model with GPS. 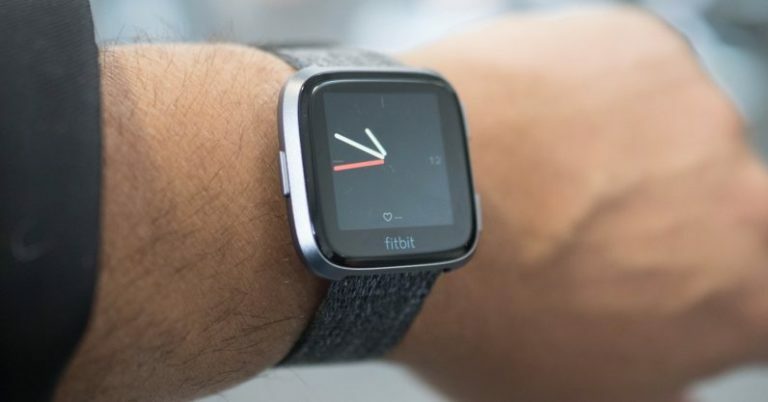 Ultimately, the things that stand out about the Fitbit Versa are its sub-$200 price and attractive design — this is a Fitbit that finally looks more like a smartwatch than a fitness tracker. With the addition of female health tracking in May, the Versa could be even more helpful to women. It’s disappointing that GPS isn’t built in and NFC is missing, but those tradeoffs may help Fitbit reach a bigger audience.